New "Card of the Week" program! To participate, either email me to set you up, or else go HERE to add yourself or update your current profile - an email will be sent to you so that you can follow the instructions to join it! 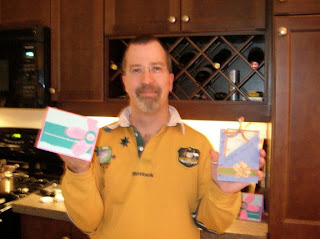 ...and not just my husband when he's scrambling to put a card together for me! 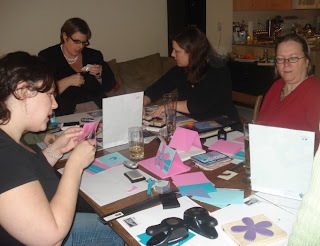 I had a stamping workshop for Amanda and her friends about 1.5 weeks ago, and her partner Tom was home as well. It was decided for him that he was going to stamp with us too! 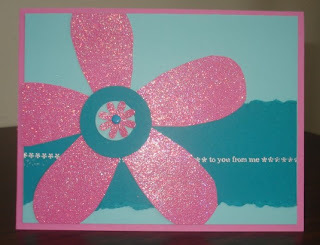 I had to apologize, since the projects we were making were VERY girly-girl... we're talking big pink flowers with tons'o'glitter, more flowers, ribbons... the whole kit and caboodle. But on the other hand... we had tools. Hammers. 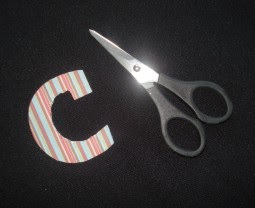 Cutting & slicing things. Heat guns. Sharp poking things. It couldn't be all bad, could it? :) We think he acquitted himself VERY well! Here also is the recipe for chicken wings from that night. 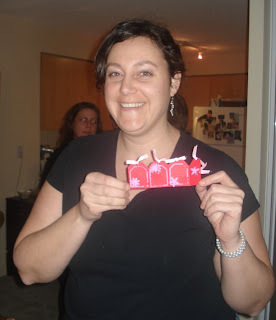 They were awesome, and Amanda has kindly shared the recipe for us. ENJOY! 1. Trim and separate wings at joints if necessary. 2. In a bowl, whisk sugar, black bean sauce, soy sauce, sesame oil, vinegar and garlic. Add wings, turning to coat. TIP: marinate the wings for about 6 hours before cooking. 3. Bake wings on a rack on a foil lined baking sheet in a 400 degree F oven for 40 minutes or until crusty and no longer pink inside. Serve hot or room temperature. Make 4 servings. 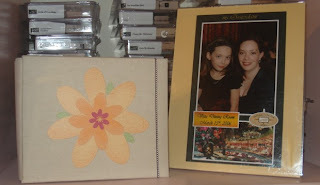 Okay, so I saw something awesome a while ago on ChiChi Allen's blog about how she used chipboard for her album cover. 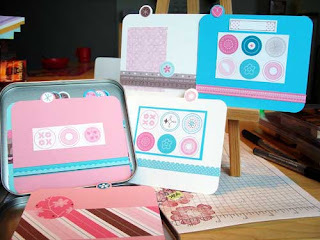 It inspired me, so I ordered the On Board Lower Simon set (which has the letters), the "At Home" Simply Scrapping kit and the Mellow Moss 8.5x11" album to do my Founder's Circle scrapbook with. 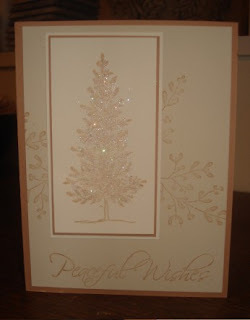 First I had to figure out how to COVER the chipboard! 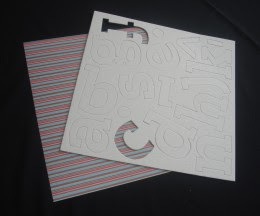 I opted to go the SNAIL route, so I popped out my letters & number, coated the front in adhesive and pressed it down face-first into the patterned paper. 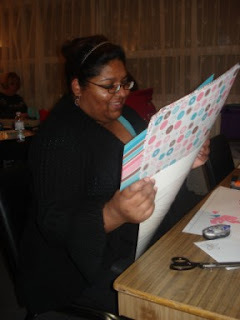 Then came the joy-n-bliss of cutting them out. 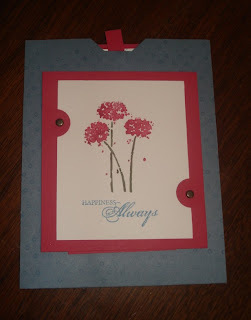 I used the Paper Snips which got into the little edges at least, but it was pretty painstaking for sure. I then used the sanding block to sand down the edges to smooth things out, and then the brush edge of my Ruby Red marker to colour the sides. 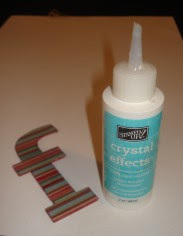 Last but not least, I chose to coat the entire letter with Crystal Effects to geta beautiful raised glossy surface. Looks pretty sharp! Next to do... assemble the cover! 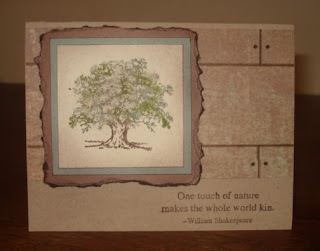 Nothing beats finding a beautiful hand-stamped card in the mail, nestled in with all the nasty bills & flyers. 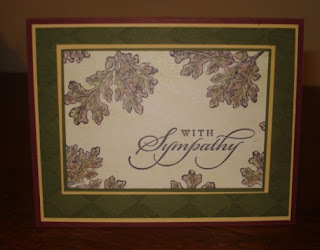 Here's a lovely double-slider card that I received from my AB (I'm geographically challenged -- hahaha) demonstrator friend, Karen Duke. I was fortunate enough to get to know Karen better last September while we were both at Founder's, and she's been a huge inspiration to me -- what a tremendous talent she has. 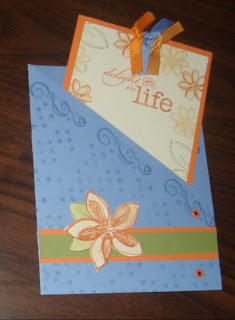 Here's the card both closed and then opened (pull on the tab at the top)... isn't it great? 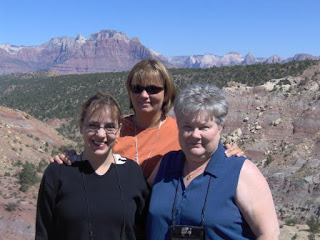 Here's a picture of Karen that was taken back in September in beautiful southern Utah (she's in the blue on the right) with my other Stampin' Up! friends: Josée from Ottawa and Jackie from Michigan. We had 12 local demonstrators come by (+ assorted guests including one sister, one friend, one 5 year old and even an adorable 6 month old baby. 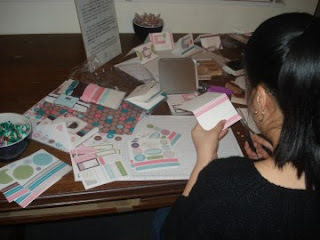 I had prepared 3 different M&T cards for them, then we had some business chit chat and card swapping at the end. I think I managed to terrorize them all whenever I pulled out the camera...I could almost hear them saying "oh, Mom, no more pictures!". (Oh wait, that's my kids talking). But they were all good sports nonetheless, smiled pretty for me, and I managed to capture some of them plus their lovely cards, too. To all the other "CI" gals out there... we miss you & wish you were here to play with us. 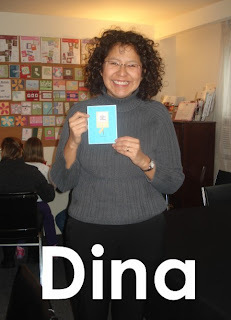 But just you wait...I have 40 cards going out in the mail all across Canada next week - maybe one will be for YOU! 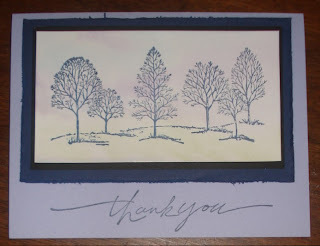 Today I am thrilled to feature some artwork by Sue Mylde. 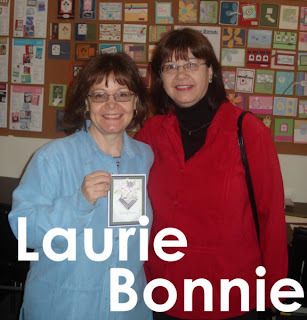 Sue is a very talented Torontonian stamper & scrapper, and you may have wandered onto her blog in the past (she's listed under the "Canadians, INK!" gals since she's in my second level downline). 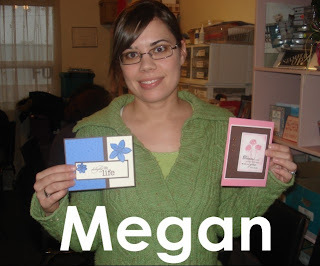 PaperCrafters Climate Change Challenge with everyone - please check it out if you get a chance. 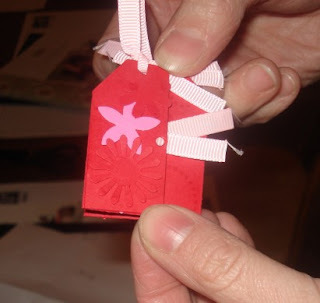 ... but the stamping inside, delightful! They're sick of me taking pictures, so I'll stop now. NIGHT NIGHT! 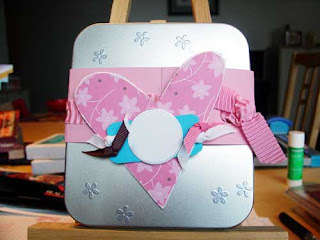 You can also see the little "purse" with 4 mini cards that we'll be making HERE, since I already blogged about them earlier in the month. 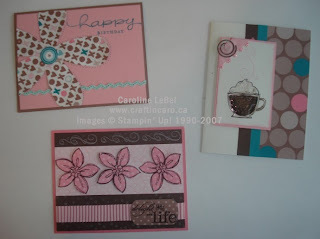 So if you are in the GTA and would like info on my classes, please visit my Stampin' Up! business Website for more details or else sign up for my newsletter. 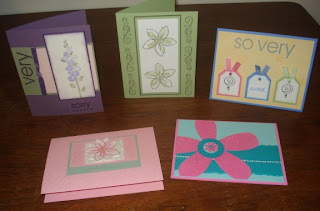 Recent cards from my Sell-A-Bration 10 card class! 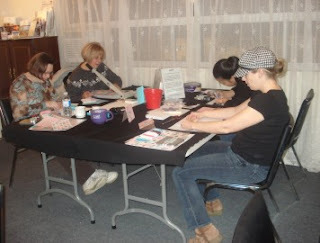 Boy, was it a busy weekend :) Hopefully all the attendees had a good time, since I sure did. 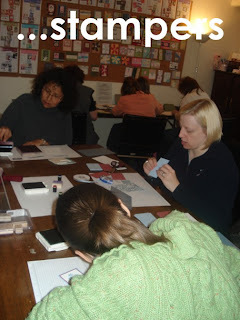 For more information on the classes I offer, please visit my Stampin' Up! 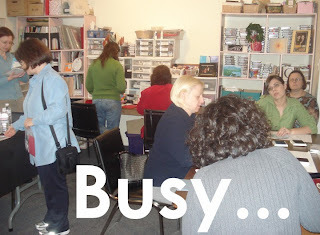 business web site, and click on the calendar in the "Opportunities & Events" section. 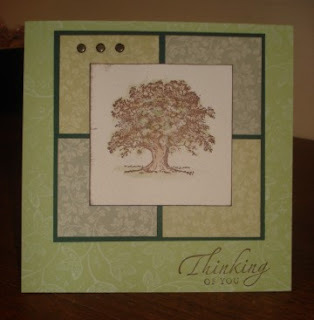 I'm slowly but surely going through everything and getting the photos taken, so here's another stamping class I did a few months back using my fave set, "Lovely As a Tree". C - Cake or Pie: cheesecake, baby! E - Essential item you use everyday: computer, die without it! V - Vegetable you don't like: TURNIP! Y - Your Fav Food: filet mignon, asparagus and escargots! 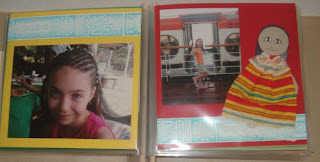 As promised (and while I wait for tonight's Stampers Club members to arrive), here are some of the bragbook pages from my Mexican Riviera cruise! 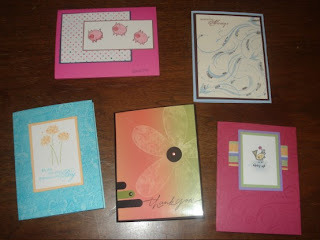 FYI, *none* of these pages were created by me - they're all swap cards from other demonstrators on the Stampin' Up! cruise. 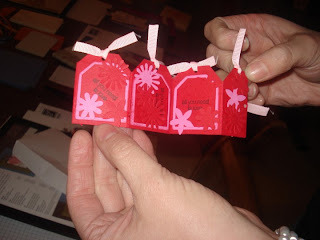 Well, I blogged about Poor Amy a few days back after the snickety-snick of her stampers club card. If you recall, her mission was to take the stop sign card (nyuk) she had inadvertently created and go home, go forth and craft something new. 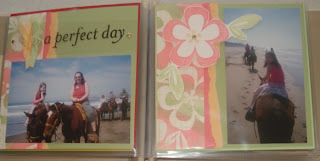 Both of the cards that I've been demoing this week are based on swap cards I received from other very talented Canadian demonstrators. 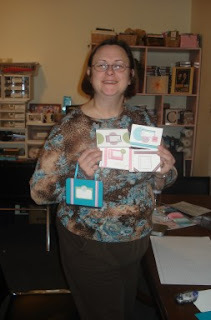 ETA: pink card was CASE'd from one by Jennifer Piche of Calgary & pocket card CASE'd by Liz Shultz. 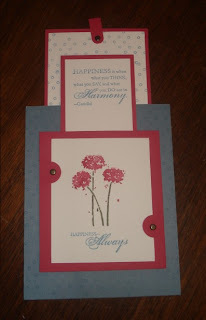 Last but not least here is some of the SPREAD! 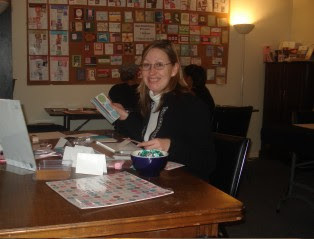 Ha, you all didn't realize that one of the best perks of being a demonstrator isn't the free stamps, isn't the cool monthly magazine, isn't the free cruises and trips, isn't the money.... ok, it is all that too. BUT THE FOOD! oooh baby, the food. The maple/walnut/rum brie was TO DIE FOR! You hostesses always feed us soooooo well. I think my weight-loss counter down at the very bottom of my blog will reflect a pretty slow decrease in poundage if I can't control myself better. I managed to admire Kat's cupcakes from afar and tried desperately not to covet them. Bev should teach lessons on how to give good plate, dontcha think? Oh yes -- on Wednesday's night at Amanda's workshop, I had the most delicious black bean chicken wings ever and that's saying something to a foody like me. 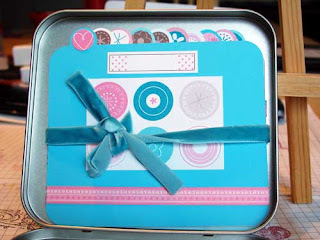 I'm waiting for her to email me the recipe (I'll share with you) as well as the pics she took of Tom stamping with us... I really want to see him with the pretty pink bling card. LOL! I plan on bringing my camera to ALL my workshops from now on... 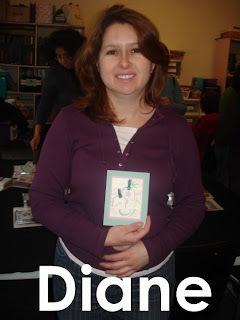 I have a fun contest I'll be starting come February, so stay tuned to learn more.